Natural gemstones come in nearly every shape and color conceivable. They grow naturally underground, are mined everywhere in the world and can be transparent, opaque or translucent. Some gems, like diamonds, are incredibly hard. Others, like opals, are very soft. Most gems fall somewhere in the middle. The hardness of a stone is measured on the Mohs Scale of Mineral Hardness, which was created in 1822 by the German mineralogist Friedrich Mohs to measure the relative hardness or scratch resistance of minerals. Knowing the hardness of a stone can help to ensure the long life of a piece of jewelry. Occasionally, mined gems do not have ideal characteristics. These gems are sometimes enhanced through artificial means. Farther down the page is a guide to enhanced gemstones. Be they natural or enhanced, it is important to know what to look for when buying a gemstone. Gem Guide: What to Look for When Buying a Gemstone? When shopping for a natural gemstone, it is important to know what to look for to ensure you are getting the right stone. The qualities of color, cut, clarity and carat weight are commonly known when shopping for a diamond. However, those same qualities hold true for shopping for a color gemstone. Each variety of gemstone has specific colors and color saturation that are considered ideal. As a general rule, the depth of color is very important. If the color seems to come from the very core of the stone, you probably have good color saturation. It is important to discuss with you Lake Country Jeweler the ideal color and saturation of your desired gem. The cut of a stone refers to its shape. There are many cuts, but among the most popular are the round, princess, emerald, baguette, cushion and trillion cuts. No matter the cut, the stone should have a good balance of facet angle, length, width and height to optimum reflection and refraction of light, also know as sparkle. Few things can reduce the sparkle and brilliance of a gemstone like poor clarity. Clarity refers to the overall transparence of a stone. A cloudy stone or one full of small imperfections, or inclusions, is not as desirable as a clear stone. However, clarity does not matter in all stones. Some stones, like opal, jade, onyx and turquoise are nearly opaque, render any measure of clarity moot. The size of gemstone is referred to as a measure of its weight as opposed to its linear dimensions. The Carat is the basic unit for weighing gemstones. One carat is equal to one-fifth of a gram, and one-hundredth of a Carat is called a point. For example, a diamond weighing 0.1 grams would equal 0.50 Carats or 50 points. A larger gemstone is often more valuable than a smaller one. A larger very high quality stone can be quite rare and carries the most value. Often referred to as The Big Three, Rubies, Sapphires and Emeralds represent some of the most valuable and coveted colored gemstones. Tanzanite is quickly becoming the fourth member of this elite club. Below, please find a quick guide to Rubies, Sapphires, emeralds and Tanzanites. Rubies are a member of the corundum family of gems. Rubies can vary in color from orange-red to red to red with strong purple hues. Good color saturation is essential to a quality ruby. Rubies are a hard stone, measuring 9 on the Mohs scale (diamonds measure 10). Therefore, an ideal ruby should have no or very few inclusions visible. A good ruby will have only a few inclusions visible under magnification. Also, the stone should be as close to transparent as possible with no or very little cloudiness. Good quality Rubies weighing over than 5 carats are very rare. Sapphires are also members of the corundum family of gems. As such, they also have a Mohs rating of 9. Sapphires can be found in virtually every color. However, blue is the most commonly sought after. Especially rare varieties of Sapphires, like the pinkish-orage Padparadscha, can be very valuable and are extrememly beautiful. However, blue is the most common, most desired, and most expensive. No matter the color, good color saturation is essential to a quality Sapphire. A good Sapphire will have only a few inclusions visible under magnification. Also, like a Ruby, the stone should be as close to transparent as possible with no or very little cloudiness. Good quality Sapphires weighing over than 20 carats are very rare. Emeralds are a very unique stone and part of the beryl group of gems. Ranging in color from bluish-green to bright green to a slightly yellowish-green, deep green Emeralds are the most sought after. Emeralds often have inclusions that are visible to the naked eye or at least under magnification. This is due in part to the stone’s rating on the Mohs Scale of 7.5 to 8. Good quality Emeralds weighing over than 8 carats are very rare. First brought to market on a large scale by Tiffany & Co in the 1970s, Tanzanites are continuously growing in popularity. Mined in Tanzania, Tanzanites are a member of the zoisite family of gemstones. All Tanzanites begin orange-brown in color. However, once heated either naturally or in a gemological laboratory, they change color. Finished stones range in color from purple to violet to bluish-violet to deep blue. Tanzanites are very trichroic, meaning they exhibit a trait where different colors are observed when the stone is viewed from different angles. Because of this, a Tanzanite’s cut will have a tremendous impact on the final color of the gem. In any case, deep, dark blues or purples are ideal. Tanzanites measure a 6.5 to 7 on the Mohs scale, making them relatively soft. Despite their relative softness, many stones have very few inclusions. High-quality Tanzanites up to 20 carats are readily available. High-quality Tanzanites over 50 carats are rare. January’s birthstone is a symbol of faith, truth, and fidelity. The transparent red and orange hues of this stone seem to almost change as the stone is moved. Legend has it that garnet eliminates sadness and depression and even warns of possible danger by changing color. February’s birthstone carries quite a legend dating back to ancient Rome. A curse on the beautiful maiden, Amethyst, turned her into a pillar of white stone. Regretting his curse, the god of wine poured the juice of a grape over the stone maiden giving amethyst its beautiful violet color. The birthstone for March is the Latin word for “sea water.” This aptly named, cool blue stone captures the refreshing color of the most beautiful waters. The ancient Greeks used aquamarine often in jewelry, believing it captured the true spirit of the sea. Bloodstone is an alternative birthstone for March. The birthstone for April is the diamond. Each is unique, endowed with a personality and character all its own. A complex blend of subtle characteristics that cannot be imitated. The brilliance, the sparkle, the dance of light and color released from every diamond is the miraculous reflection of the very fires of creation. This birthstone for May was believed to have special powers to improve a person’s psychic abilities. Emerald, the color of envy, would help reveal the truth of a lover’s words. Emeralds usually have a garden of included crystals trapped within it. Emeralds are always in vogue and always held in the highest esteem. They are often reserved for regal pieces of jewelry encrusted with diamonds or pearls. Small to medium-size stones are faceted in the step-cut (also called the emerald cut) or other popular shapes for rings, pendants, pins and earrings. They are also cut into a dome shape and occasionally carved. June’s birthstone was treasured by Roman Emperors Caligula and Nero. Legend has it that Nero even built pearl couches for his paramours. Pearls were also considered the symbol of purity and chastity. The appeal of the rich red ruby goes back to ancient times. Ruby represented passion, power, affection and majesty to the ancients. Rubies of old were often associated with dragons. It was believed that wearing Rubies in war made a soldier invulnerable. It has always found its way into the coffers of kings and queens. Large Rubies are usually wedded to diamonds in rings, necklaces and bracelets. Smaller stones are linked with gold, clustered into earrings or suspended from a fine gold chain. They may represent the petals of a flower or the eyes of a lion. The ancients called August’s birthstone the “gem of the sun.” When set in gold, the mystical yellow-green hues create an enchanting beauty. It was believed that Peridot could chase away evil spirits and dissolve curses… but only when set in gold. Sardonyx is an alternative birthstone for August. September’s birthstone is calming and soothing. The variety of color makes the Sapphire one of the most fascinating of all the precious stones. Sapphire is ruby’s sister stone. Legend states that Sapphire was considered a remedy for various ailments, poisons, melancholy and even eye problems. Sapphire is actually made of the same mineral that ruby is made from—corundum. Red corundum is called ruby and all other colors are called Sapphire. And Sapphire does come in many colors. A rich, velvety blue is the most popular, but Sapphire may also be pink, orange, yellow, violet, green, brown, colorless or black. Blue Sapphire is especially fashionable because its color complements just about any outfit. Sapphire may be faceted or dome-shaped. A luminous star may be seen in stones whose internal structure is just right. The birthstone for October was believed by the ancients to bring good fortune and banish evil spirits. Arab cultures believed that opals fell from heaven in flashes of lightening. The opal is a phenomenal gemstone because of the interesting visual effect its structure creates. A pattern of silica platelets causes a diffraction grating, resulting in a variety of color combinations, mainly reds, blues, greens and oranges. Opals are cut into dome shapes, formed into beads or carved into pendants. They are often accented by diamonds or colored stones which pick up the flashes in the gem. A fine opal with a predominance of red welcomes the company of fine Rubies or garnets. Legend has it that November’s birthstone was discovered on an ancient, mysterious island in the Red Sea. The stone was carefully guarded. Those who attempted, without permission, to approach the island were put to death. Sherry topaz is so called because it catches light like sherry wine in fine crystal. This golden color is what most people think of when topaz is mentioned, but actually the reddish-orange Imperial topaz is considered the finest color. Sometimes topaz is found in blue, pale green and violet. This elegant gemstone is usually set into rings, pendants and pins with diamond accents. December’s birthstone is rich with legend and folklore, from ancient Turkish culture to the Spanish explorers who settled the American southwest. This intricate bluish-green stone has minute traces of copper to give it a truly distinctive beauty all its own. An alternative birthstone for December is Zircon. Brilliance, sparkle and deep rich color… these are among the qualities that draw us to natural gemstones. Over the centuries jewelers have developed many, many methods of enhancing these traits in a gem. These enhancements are meant to improve upon the natural properties a particular gemstone. After a stone is mined, its natural development essentially stops. Any imperfections in the stone are there to stay unless someone steps-in and enhances it. These enhanced gems may undergo processes to deepen or change their color, remove imperfections or increase their brilliance. Enhanced gemstones are very beautiful stones and often have the most ideal of colors and the most sparkle at a lower cost when compared to a natural gemstone with the same characteristics. A basic understanding of these enhancement techniques will add to your appreciation of the beauty, durability and value of the gemstone jewelry you already own or purchase in the future, as well as help you to choose the perfect stone for you, be it a natural gem or and enhanced gem. Any treatments and enhancements to a gemstone should always be disclosed by a jeweler, as well as any special care that might be required. 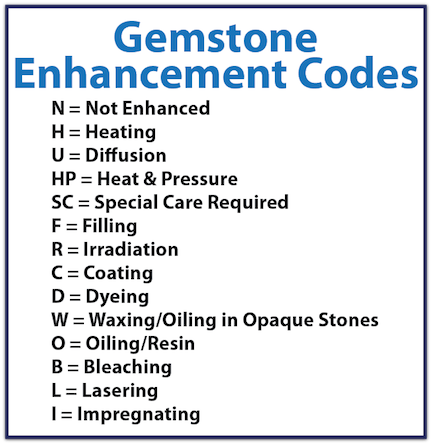 To the right is a chart of the codes for specific gemstone enhancements. If you have any questions on enhanced versus natural gemstones, the staff at Lake Country Jewelers are here to help. Contact us, and we’ll help you pick your next gemstone. Amethyst and Citrine are gemstone varieties of quartz. Amethysts can be heat enhanced or irradiated to perfect their color and bring out the ideal deep purple hues. Brownish varieties, when heated, will turn the bright yellow or intense orange colors ideal in Citrines. This enhancement method is permanent and will last for the life of the gemstones. Within the structures of a Diamond, impurities or inclusions can be found. These inclusions trap light and distract from the Diamond’s radiance and sparkle. Jewelers have perfected a Diamond enhancement technique using focused lasers to vaporize imperfections and cut small passageways. These extremely small passageways are then filled with clear resins or glass hard substances, rendering them nearly invisible to the naked eye. Only extreme heat or specifically formulated chemicals can remove the filling from the laser passageways and reverse the enhancement. This method is also used to fill fissures that reach the stones surface. Not all Diamonds have perfect color. Extreme heat-treatment or irradiation can permanently enhances a Diamond’s color and brilliance. Pearls that have grown naturally in the wild are very rare. Because of this rarity and the difficulty involved in harvesting these wild pearls, a technique call culturing has been developed to grow freshwater and saltwater pearls. To create a cultured pearl, oysters are carefully seeded with irritants. The oyster then covers the irritant with layer of upon layer of nacre, thus creating a pearl. This process can take anywhere from a few months to many years, depending on the desired size of the pearl. Because the exact shape of an irritant used in to create a cultured pearl can be controlled, it is easier to grow a spherical cultured pearl than it is to find one in the wild. Not all pearls have the perfect luster or color; therefore methods have been developed over time to enhance a pearl’s beauty. From the year 400, one of the earliest known methods to enhance color and luster required that a chicken swallow the pearl. The belief at that time was that the chicken’s digestive system would soften the pearl’s blemishes and even the color. Today, cultured, fresh and saltwater pearls are often bleached to achieve a uniform color. Thankfully techniques have evolved significantly over the past few millennia. Modern jewelers may polish pearls in tumblers to ensure the desired round shape and luster. Additionally, naturally colored pearls are in short supply. Some pearls are dyed or irradiated to achieve the deep blacks, grayish blues, rich pinks and golden hues that are highly sought after. To care for your cultured Pearls, avoid using nail polish, abrasives, solvents and polish removers while wearing them. Nature rarely produces Topaz in the blue variety, although some examples have been found. Challenged by this rare occurrence of nature, an enhancement method is used to excite blue color from a clear or brownish Topaz variety. After the raw Topaz is mined, it is irradiated to brown and then heated to a rich sky blue. This enhancement process is permanent. Many Aquamarines are greenish when mined and cut, despite the clear blue colors brought to mind by the name Aquamarine. Aquamarines are sometimes heated to intensify their bright, ocean blue. Like the heat-treatment of Amethysts, Aquamarines that are heat-treated maintain their enhanced colors permanently. Most Emeralds have unique birthmarks that distinguish them as genuinely natural gemstones. 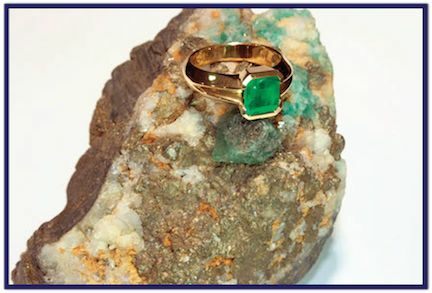 In the past, early gem merchants in India would even the color of their Emeralds by immersing them in clear oils or paraffin wax to render surface fissures nearly invisible to the naked eye. Today, jewelers use a modern version of that ancient technique. Clear resins penetrate the open fissures surfacing in the stones while chemical hardeners complete the process and give the enhancements a degree of permanency. Imperfections and impurities in rubies may be removed by controlled heat-treating of the gems. Some rubies have fissures or surface breaks that are filled with a glasslike byproduct of the heating process. Care should be observed when wearing fissure-filled rubies. This enhancement technique may wear over time if treated harshly or exposed to strong solvents or abrasives. Sapphires come in nearly every color of the rainbow, the most notable of which are the deep, rich blues. Perfect sapphires are extremely rare, so over the centuries, methods have been developed to enhance a sapphire’s colors. This is often achieved by controlled heating of the gemstones to improve its clarity and richness. Heating sapphires is a permanent enhancement. Tanzanite is renowned for its exquisite combination of purples and blues. Mined in Tanzania, Tanzanites require heat to transform from the initial orange-brown to the violet-blue color for which the gemstone is known. Some Tanzanites are heated naturally, underground before they’re mined, such as by a volcanic vent. Other Tanzanites are mined before they have a chance to change color. These stones are carefully heated in a laboratory setting. While still other mined Tanzanites can be light or pale in color. Heat-treatment or irradiation can deepen the blues or purples and created a stone with an ideal color. Tourmalines are found in an abundant array of colors. Dark blue, blue-green and green tourmalines are often heated to lighten their color. Red or pink tourmalines can also be heated or irradiated to improve their colors. Heat-treatment and irradiation color enhancement of tourmalines are permanent. Occasionally, some tourmalines may have surface breaking fissures that are filled with resins and hardeners. Care must be observed with these gems. Avoid exposing them to harsh abrasives and strong chemical solvents.